When it comes to field-tested, quality gear, no name is more valued than Smith & Wesson. The new M&P M.A.G.I.C. 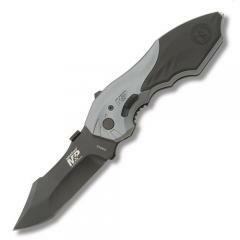 Plain Assisted Folding Knife is one of power, strength and dependability. The 4034 stainless steel blade is honed to a razor sharp point and coated with a sleek black finish, ensuring a lasting edge that will not easily dull. Assisted-opening technology combined with the knife's flipper tip and ambidextrous thumb studs, offer rapid deployment with just a quick twitch of the thumb. Once opened, the liner lock takes over to secure the Bowie-style blade in place. An ergonomically-shaped handle fits perfectly in the palm of the hand. A Zytel® onlay offers additional gripping strength and increased blade control in wet or icy conditions.